A look at the new wave of snooker players hoping to make an impact on the world stage. Many regard the young Glaswegian as the best talent to emerge in snooker since Ronnie O'Sullivan. Of course, O'Sullivan still rules the roost but this year Maguire dramatically closed the gap between himself and 'The Rocket'. The 23-year-old came to prominence in March when he beat Jimmy White to pick up his first ranking title, the European Open. This season, Maguire has already beaten O'Sullivan twice, reached the British Open final and picked up the UK Championship crown. He has been installed as second favourite for the World Championship. The mention of "Australia" and "snooker" in the same breath would usually provoke the response of "Eddie Charlton" and "Quinten Hann", but soon the name of Robertson may join that small legion. The flame-haired 22-year-old set the stage alight in Malta this year when he beat Ken Doherty and David Gray to reach the last eight of European Open, where he was defeated 5-3 by Jimmy White. The Melbourne left-hander reached the Wembley stages of The Masters having won the qualifying tournament, although he fell to White at the first hurdle. Robertson then went on to make the final stages of the Players Championship. The Chinese teenage sensation is far from being the finished product, but he has already carved out a reputation on the snooker circuit. 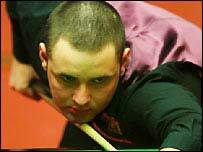 He reached the third round of the British Open, before losing to finalist Stephen Maguire. The Wellingborough-based player also qualified for the final stages of UK Championship only to surprisingly succumb to a 9-3 defeat at the hands of Dominic Dale. He made his big-stage debut at The Masters this year after he was handed a wildcard. He defeated Joe Perry in his first-round match before losing to Stephen Lee 6-5. Should Ding continue to climb the rankings, then the sport's popularity in China and the rest of the Far East is almost certain to explode. The Chester-born star reached the third round of a ranking event for the first time when he beat John Higgins 9-7 at this year's UK Championship. Walden, a former World Snooker Young Player of Distinction, also beat Higgins in the first round of the Grand Prix before falling to fellow rising star Stephen Maguire. Higgins handed the Wales-based star a compliment, of sorts, after their UK Championship match. "Ricky is a great player. With the greatest respect he does not look like a player but he certainly is one," said Higgins. While John Parrott, who eventually beat Walden, said: "He's a little bit raw, but if he gets that together he's going to be an absolute handful for anybody." Liu is another of a new and exciting stars to emerge from the Far East. 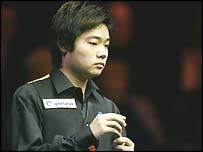 The young Chinese player came to prominence when he finished runner-up to Australia's Neil Roberston at the 2003 World Under-21 Championship. As a result of his performance, he received a passage to the main WSA tour. It did not take Liu long to impress on tour. He became the first Chinese player to reach the televised stages of a ranking event, beating Fergal O'Brien 5-4 in qualifying to book his place at the Welsh Open. He lost 5-3 to Hong Kong's Marco Fu, but made the snooker world sit up and take notice. Liu has yet to make an impact this season, but along with Wellingborough practice partner Ding Junhui, has the potential to go far in the sport.